Whenever menu states they have chicken wings on the menu, I have to try them! They are my weakness. There are something mess and cave lady like when eating them which I just love. 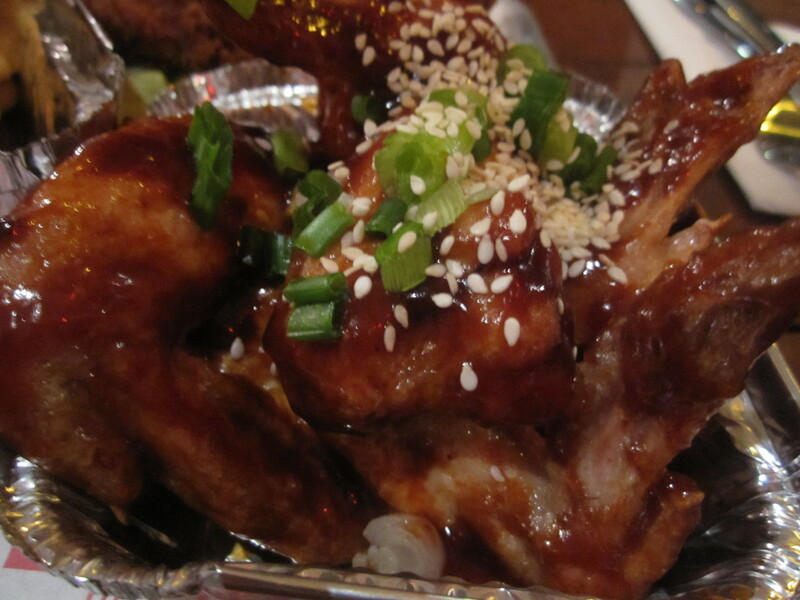 We went for the BBQ chicken wings with hickory smoked BBQ sauce, topped with chopped spring onions and toasted sesame seeds. 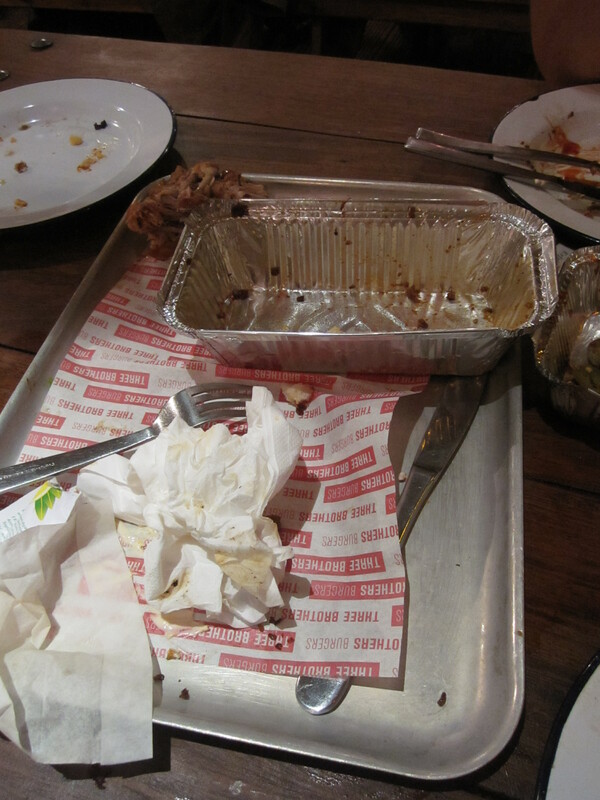 Our kind waiter took pity on us and our messy faces and fingers with plenty of wipes after mush gnawing on the bones to get every scrap of plump tender sweet flesh. With your burgers, you’re gonna need fries to go with them. Why just go for normal plain fries when you can go for Chilli Cheese Fries?? 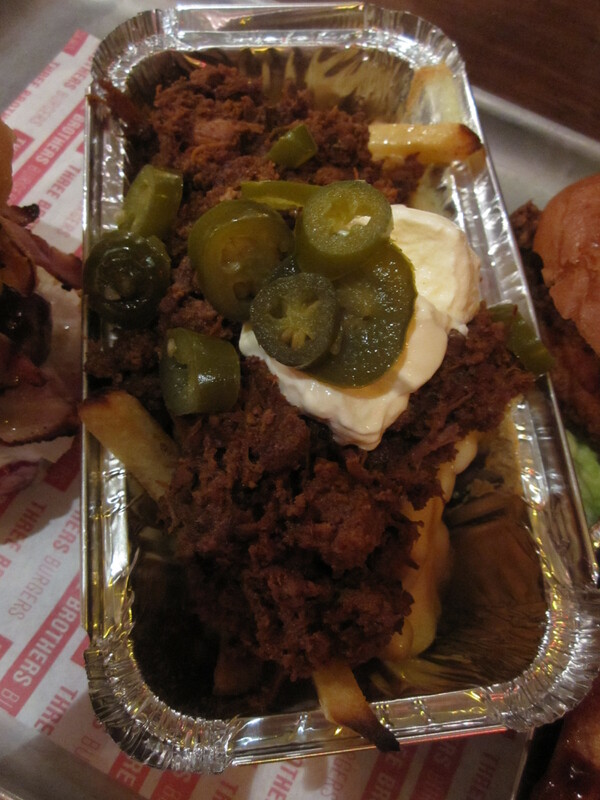 A hefty portion of golden crispy fries topped with Monterey Jack cheese and covered in smoky slow cooked beef brisket chilli, jalapeños and sour cream. Tender brisket paired with the cooling sour cream and fiery chillies really bring the side dish up to the next level. Now to the main event. 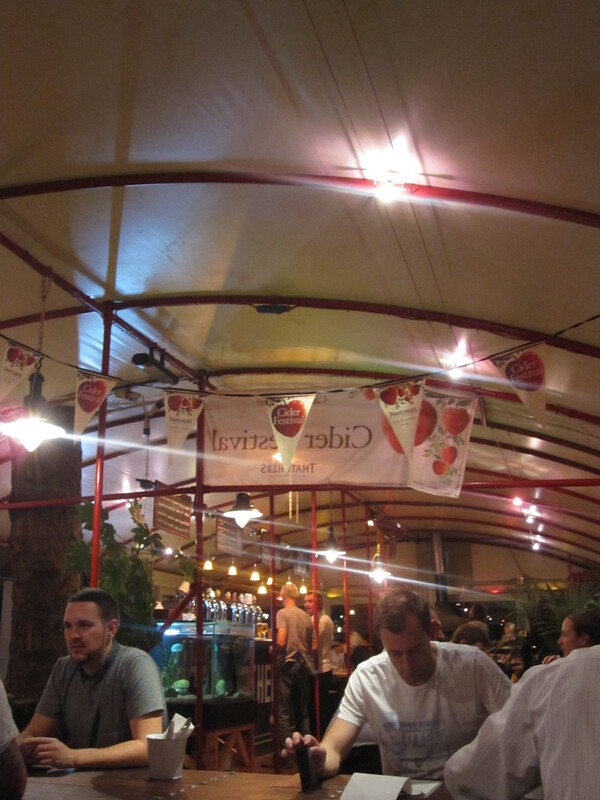 Drum roll…… THE BURGERS!! We went for two to try out. 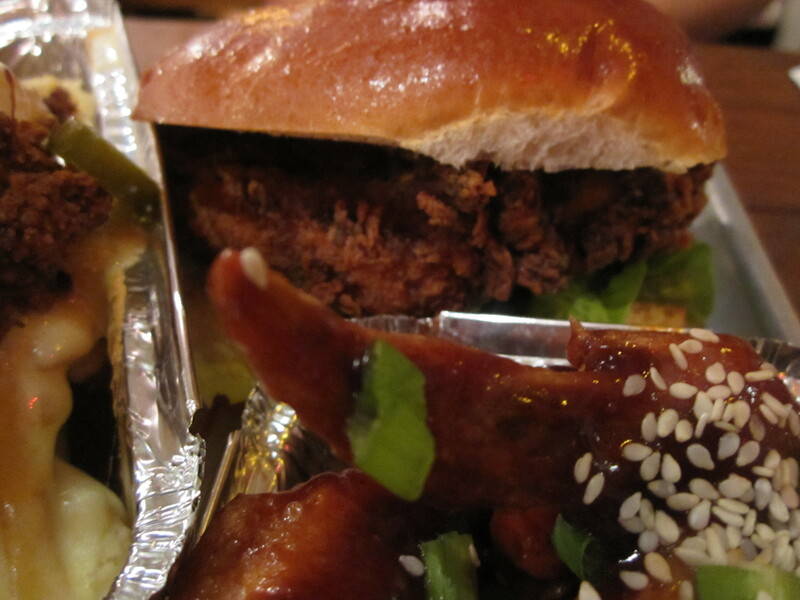 The Buttermilk Fried Chicken and The Smokey Bro Burger. The Smokey Bro – Single patty topped with smoked Applewood cheddar, sweet cured bacon, house-made relish and crispy onions. 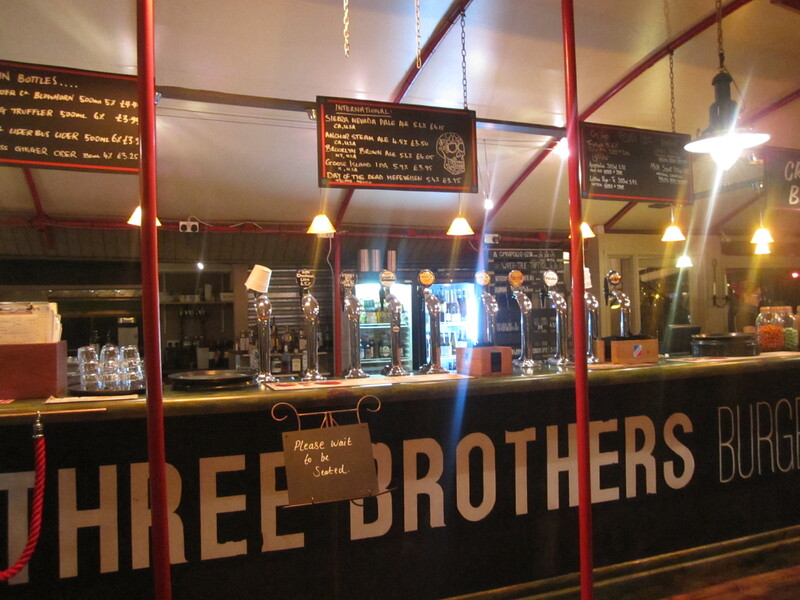 The Three Brothers Burgers are made in house, using 28 days aged Herefordshire beef, served pink in a soft, glazed brioche bun. That’s a whole lot of smoke! The cheddar cheese oozing together to bind with those crispy little nuggets of crispy onions with one hell of a juicy burger. Delicious. And some get news that during November The Smokey Bro will be renamed the Smokey Mo for Movember who raises money for the work in saving and improving the lives of men affected by prostate cancer, testicular cancer and mental health problems. From every Smokey Mo bought in November £1 will be donated to this great charity. The perfect excuse to go and try out this delicious burger all in the name to support this great charity. It also does mean you can feel not guilty at all having a Smokey Mo every day in November. Following the Smokey Bro Burger we went for the Buttermilk Fried Chicken Burger, buttermilk marinated whole chicken breast, deep fried and served with Cajun mayo and baby gem lettuce. Chicken burgers can sometimes get a bit dry but being marinated in the buttermilk, the chicken stays incredibly moist and tender. 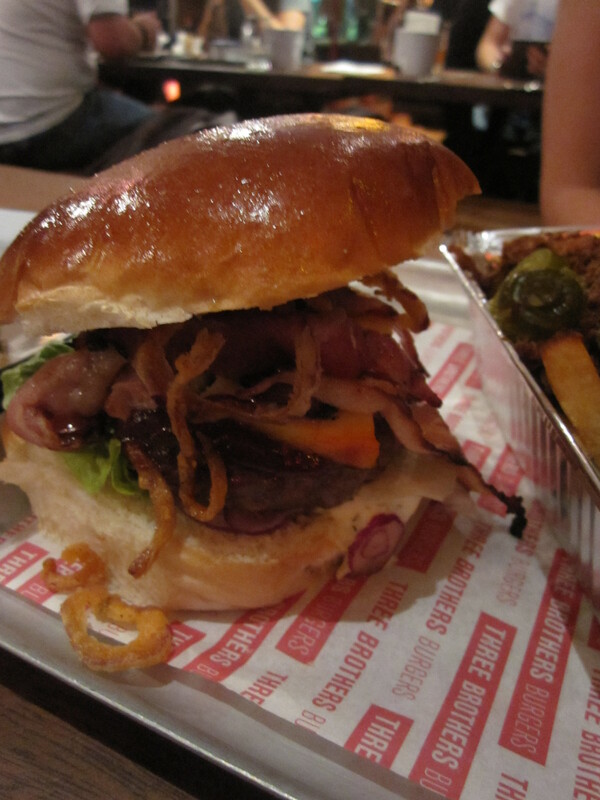 The batter had a hint of fennel seeds which helps cut the richness and heat for a truly great burger. Move over Colonel there is three more boys in town. Now pudding time!! Remember how my friend had her milkshake before starting her meal, well now she wasn’t up for something sweet so instead she got an order of deep fried gherkins. As you do! 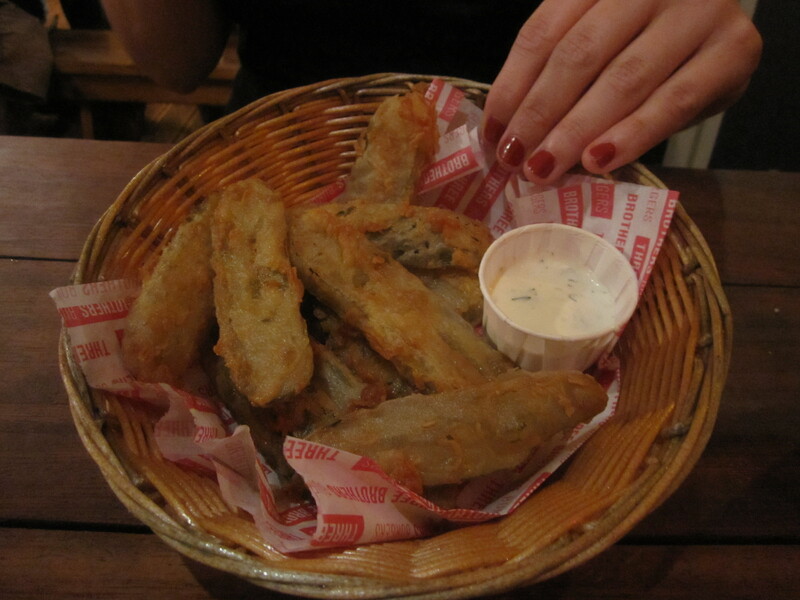 Served with tangy blue cheese sauce, salty juicy crisp gherkins are a thing of beauty! 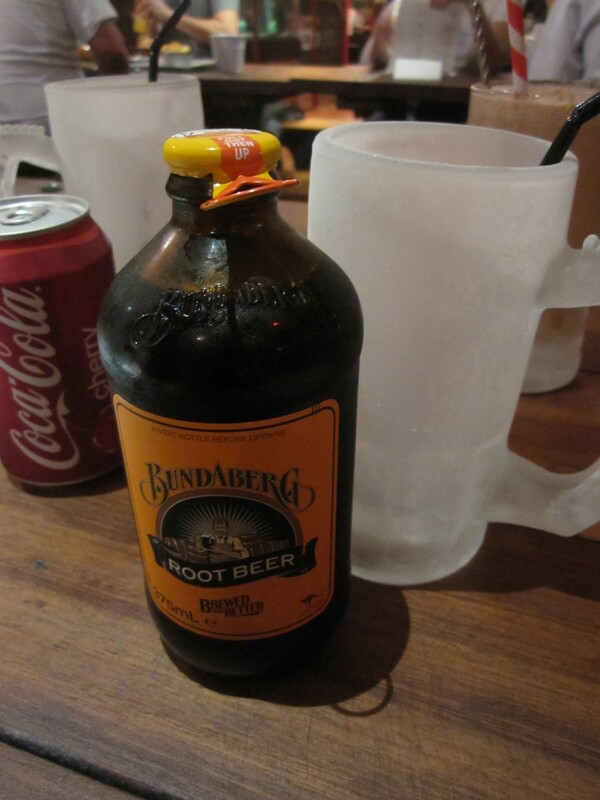 My other friend and I were up for more traditional dessert options. 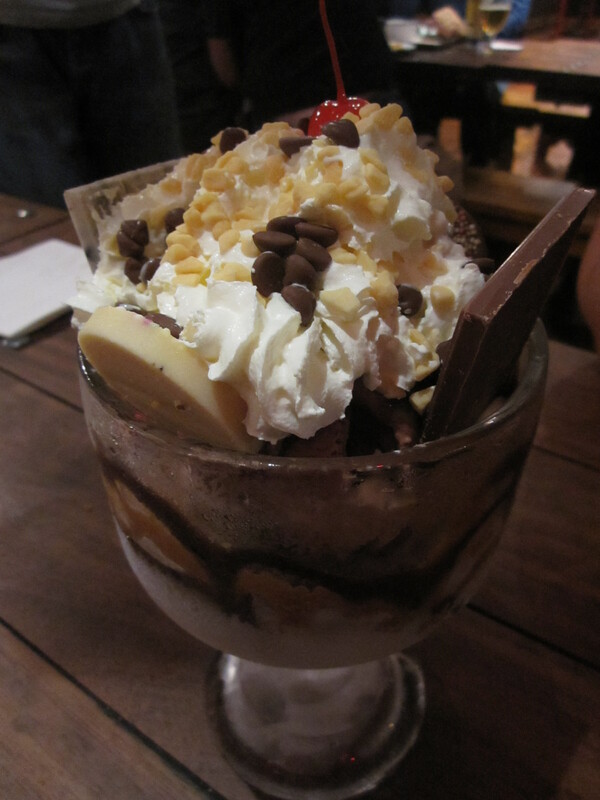 We went for the chocolate and caramel ice cream sundae. 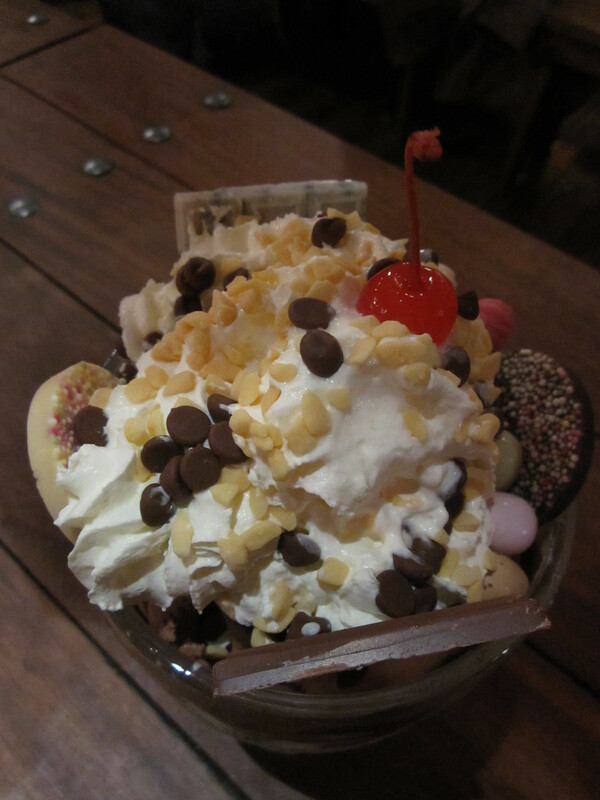 Lay your eyes on this showstopping sundae! Homemade chocolate and vanilla ice cream, caramel sauce, chocolate brownies, honeycomb, chocolate chips, chocolate bars, giant chocolate jazzies, whipped cream and, of course, a cherry on the top! 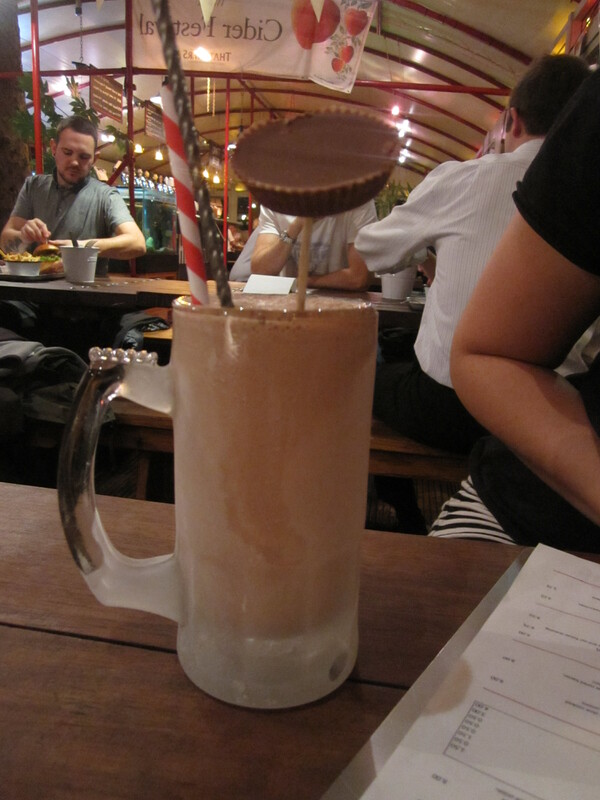 I mean, look at this beauty! 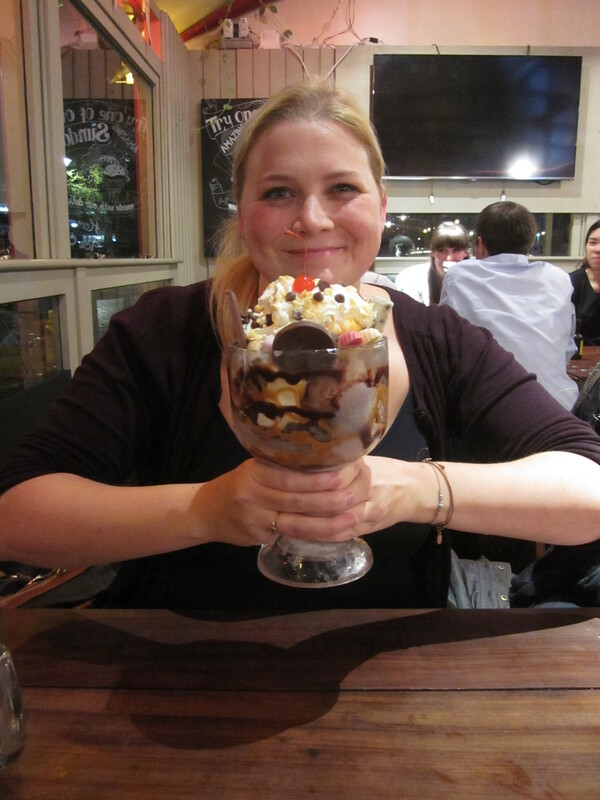 It took two hands to even lift up this hefty amount of ice cream and treats! 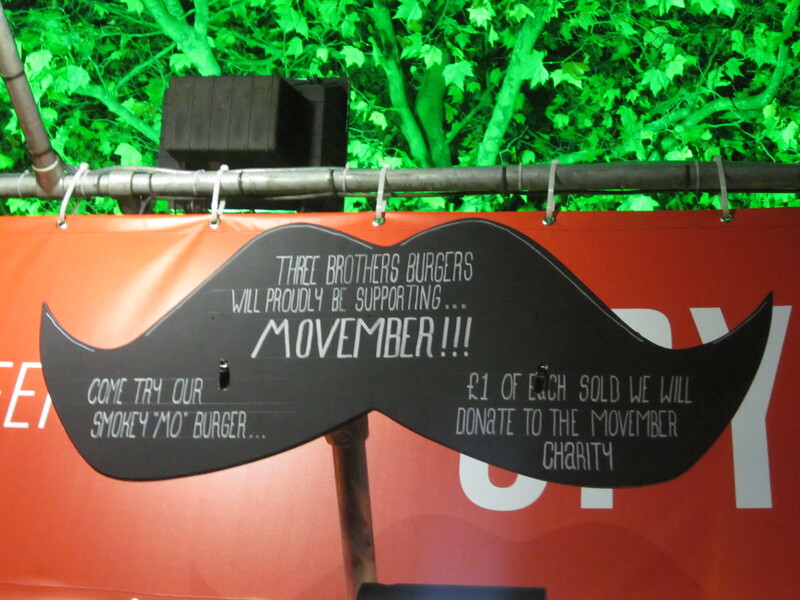 Head down to try a Smokey Mo for Movember in November to support this great charity. 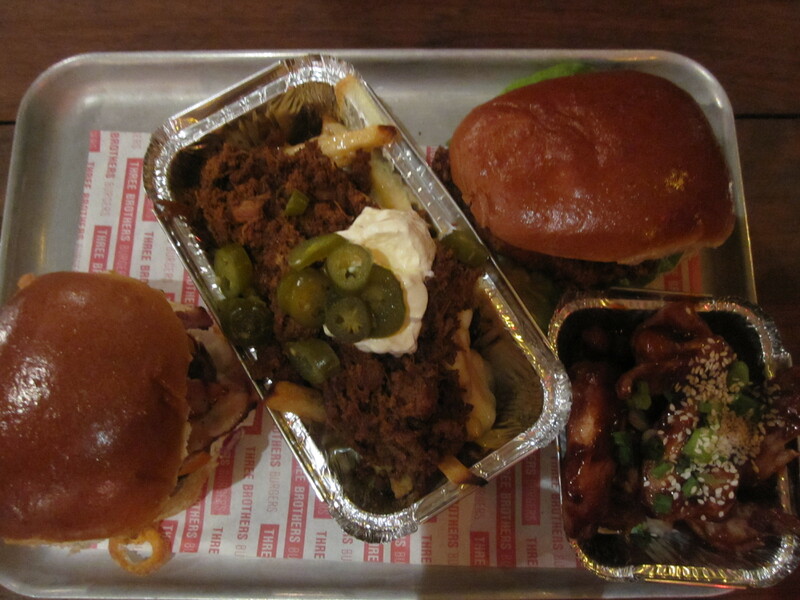 Also, if you are a student try their deal of a Classic Burger and fries for the crazy price of £5!!! 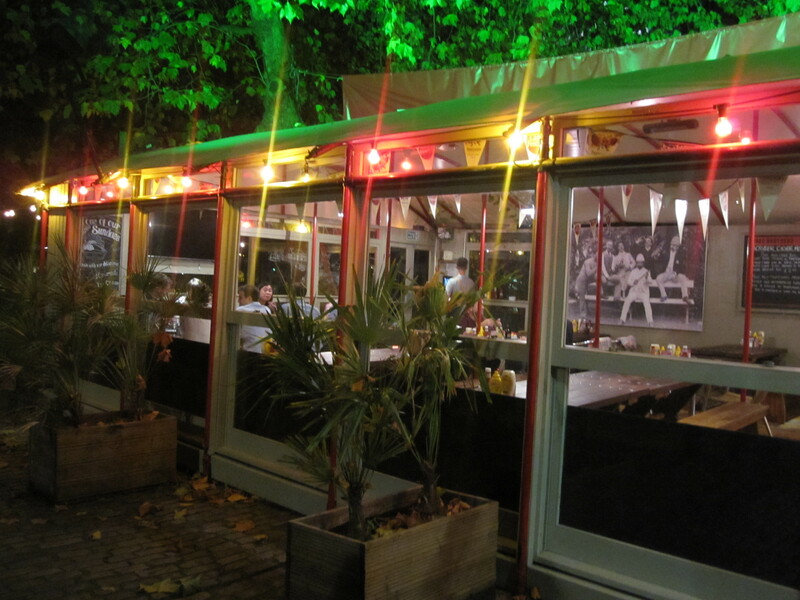 I’ll be back to this friendly local burger boat and can’t wait for the warmer weather to spend Summer evenings on the river with an icy glass of cider and a juicy burger.